We always talk about how our skin suffers in the cold months as it starts to dry out. 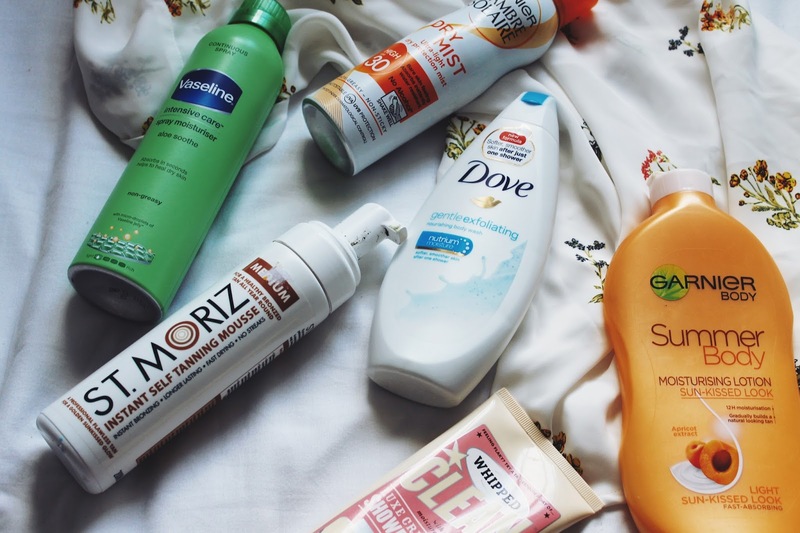 However, I think it's still, if not more, important to look after it in the summer as well as helping it out with that summer glow so here ae some of the products I love to use on my skin in summer. Vaseline Intensive Care Skin Moisturiser: This is great for the warmer months because who can be bothered to stand there in the boiling hot sun slapping on a layer of moisturiser. This is a quick alternative that gives me the same amount of hydration in a convenient spray bottle. Little tip: if it's really warm, put this is the fridge or somewhere cold to act a colour spray as well. Garnier Ambre Solaire Dry Mist Sun Cream: Of course, we need to wear suncream and, again, sprays are just a much speedier way and faff free way of doing that. Just spray, rub it in and go. Great protection for your skin this summer. Dove Gentle Exfoliating Body Wash: This not only hydrates but, as in the name, exfoliates the skin just enough so help smooth and buff my skin without being top vigorous. It also helps to give my legs that amazing newly shaven feel after shaving. Soap & Glory Whipped Clean Shower Butter: I've spoken in the past of the Nivea In-Showers Body Moisturiser and the Lush Skin Conditioner; this is similar. Allowing you to lock in moisture and saving time after stepping out of the shower as sometimes there's no need to add ay extra lotion. I also find it's a great base before applying fake tan. St Moriz Fake Tan: I included this in my Summer Edit but this is the best fake tan for all year round but, if like, you can't tan or just want to top up your tan, this adds a great, subtle bronzed look to the skin that I love. With a tanning mit, it's super easy to apply and drys quickly. Garnier Summer Body Lotion: Another one I've mentioned before. If you want to just a add a small tint to your already tanned skin or find fake tan to look too intense or even want to ease your way into tanning this is an inexpensive way to do that. Plus, it smells so nice. THE SUN!! (Obvs): While away and out in the sun, the sun really helped my skin. My Keratosis Pilaris was the best it had been in years all because of the sun. Of course, you need to stay protected with sun cream which I did but the natural sun does have its benefits. What skincare products do you reach for in summer?